My Journey to Fit: Friday Mishmash! Completely exhausted after his trying day! Dis make ebryting worth it! A cheeseburger, plus a steroid shot, and a new flea collar that doesn't seem to be causing him any adverse reactions, and he's a happy dog. Wheee! Throw petals at me!!! This was on the last hill, when I spotted the photographer as I was walking up it and started running for the picture. I like this picture because I'm laughing here, and embodying the "Run Happy" mantra that is on my shirt. Gotta love the 70s-style runner behind him! I can't remember what we paid for our race registration - it wasn't super expensive - but we sure got a lot of bang for our buck, and these free pictures were icing on the cake! Yarn is Schachenmayr Regia Design Line by Arne & Carlos, colorway is 3762, pattern is my own toe-up sock pattern incorporating the Fish Lips Kiss Heel. 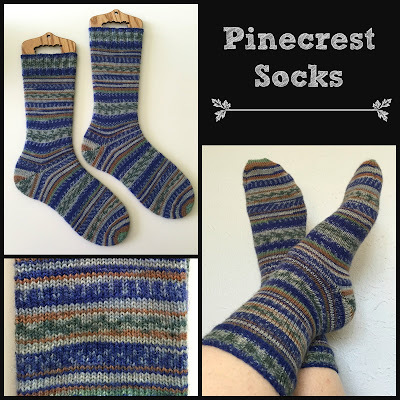 As you have seen, I like to name my projects, and as this sock started developing, the colors made me think of one of the best places where I got to spend time as a kid - Pinecrest Lake, in California. This sock had the blues of the lake where I swam and sailed, the grays of the giant boulders that I climbed, and the browns and greens of the pine trees - it was such a beautiful place and I have such wonderful memories of Pinecrest, so this name seemed fitting. We are going to run 5 miles tomorrow, breakfast at Blue Baker, and then install a new faucet in our kitchen sink. When the current one began leaking again (we've fixed it once a few years ago), we decided that it was old enough (13 or 14 years) and time for a new one. Then I fell down the rabbit hole of wanting to replace the sink as long as we were at it, and that lead to changing out the countertops, which also lead to cutting down the bar and installing a backsplash. Then I remembered that I don't have the money for all of that, so we just bought the faucet. Oh well. 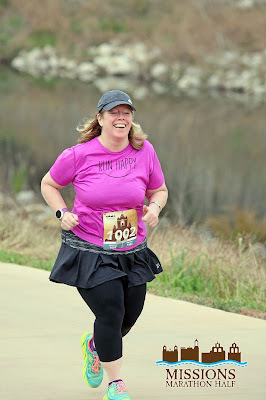 You look good in all your race photos! I think its great that you got them for free. You make me want to learn to knit socks maybe soon I will. This is our anniversary weekend. 19 years we will be married on Monday not sure what we are doing this weekend but we will celebrate it before Monday. Have fun running your five miles tomorrow. Have a great weekend. Yay for free race pics. They turned out great! Those are some great race pictures! And more free pictures?! I need to start finding races like that (not that photographers ever find me and/or snap good shots of me). 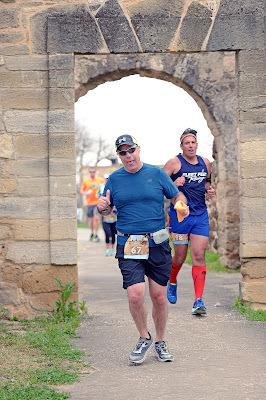 I just love when you get free race pictures! 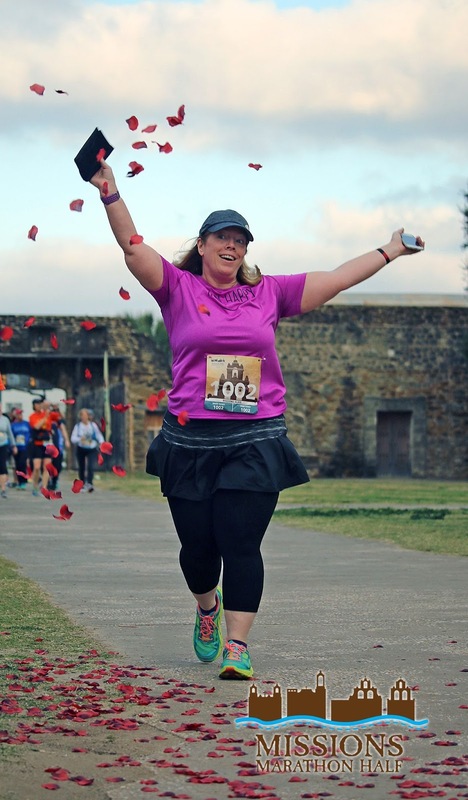 Running through rose petals is a first. That's a great picture too. Paco looks like my Mojo, except Mojo's spots are red. He goes through episodes where he licks his paws raw. I think a cheeseburger would make anyone feel better. I'm very impressed with your knitting skills! 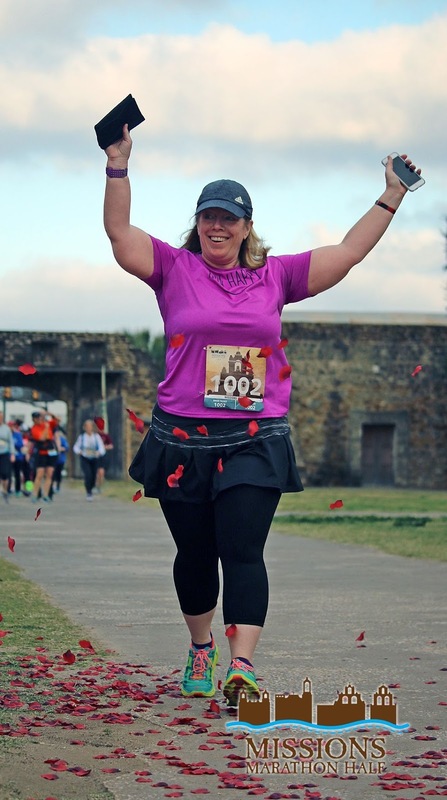 You are making me want to plan a trip to San Antonio and run that race! You do look like you are running happy. The visual of Paco and Kip rumbling with the neighborhood cat gave me the visual of the Sharks and Jets LOL! Poor, poor Paco. I hope the steroid shots work well for him! You look so happy in those pictures, too. I probably would have stopped and gathered the rose petals LOL. Oh I am so impressed that you knit. I wish I had the time to knit. I love how it relaxes me. Poor Paco. Looks like that cheeseburger helped. 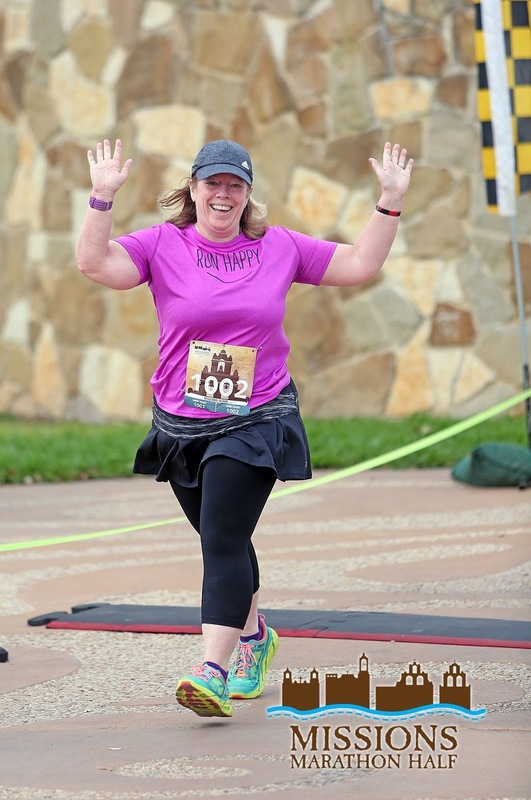 And free race photos are awesome. You look great in yours! Buah ha ha re: the faucet rabbit hole! That is how it goes when you repair one thing! Your pictures look SO great! 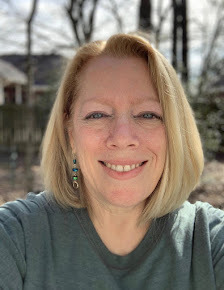 I love the expression on your face, and it does go so well with your shirt. The rose pedal pics are super neat. One a fun race. Those are the best race pics I've ever seen. And they're free! How cool! I think I want to run that race. I can't stop giggling about the repair/remodel rabbit hole. You speak the truth, girl. Thats awesome they gave you the photos for free! How fun!! And Paco looks like he's in doggie heaven with that cheeseburger. A great payoff for his pain, too! Your socks are amazing! I can't believe you made those! Can't believe I missed this post on Friday. Poor Paco! The allergies were bad enough, but then adding a cat claw in his head!! Yes, a cheeseburger was definitely in order. Cat scratches can be very dirty--humans sometimes need IV antibiotics. Hope he is improving by now. Love the race pics. Love almost more that they are free. And the socks! And your name for the socks!! How fun to wear comfy socks that bring back such great memories. And lastly, the faucet story was really funny. Because I am reading along, and I am thinking, oh my gosh, she's really going for the whole thing!! In the end,isn't having a shiny new faucet fun? Awww poor Paco, I hope he feels better by now. Seems all our furry friends have troubles at the moment: Paco, Pixie and Bella. 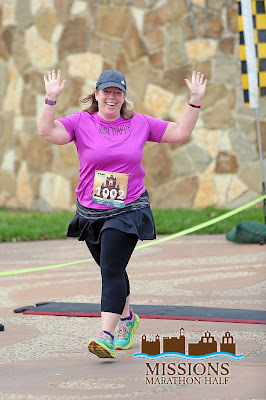 I just love love love the race photos. There's so much happiness in them. You look fantastic. Poor puppy....it's such a rough life! Oh PACO!!!!!!! AWWWW!!!!! Glad he's had his shot, his cheeseburger, and all is better in his world. Congrats on the race. I just LOVE the pics of you both!!! !